The U.S. Air Force is rewriting its war plan for the Pacific, the flying branch’s new commander for the region told reporters at the Pentagon in late November 2018. Gen. Charles Brown, commander of Pacific Air Forces, said he wants smaller groups of U.S. warplanes to rapidly move between bases in order to frustrate an adversary, and to do so while the enemy — that is, China — is jamming American communications. The ideas Brown mentioned aren’t actually new. They slowly have been developing for years in Air Force, Army and Marine Corps intellectual circles. Brown said he’s working to “operationalize” a classified Pacific Air Forces strategy that his predecessor Gen. Terrence O’Shaughnessy, now the commander of U.S. Northern Command, originally championed. The twin ideas of distributed forces and independent command could point the way toward a more flexible and resilient form of U.S. air power that’s less reliant on large bases and top-down micromanagement and could help to offset China’s own expanding military power. Ironically, a shortage of F-22 stealth fighters helped to drive the new approach to aerial warfare. In 2013, the U.S. Air Force’s Alaska-based 3rd Wing devised a new way to deploy its 40 F-22 Raptor stealth fighters in order to make the most efficient use of the limited overall number of Raptor airframes — just 120 or so of the roughly 180 F-22s in service are “combat-coded” and equipped with the latest software and weapons. The 3rd Wing gave the idea its “Rapid Raptor” name and proudly briefed the concept to the Air Force’s then-chief of staff Gen. Mark Welsh. The aim was for the 3rd Wing, during wartime, to quickly disperse its F-22s across many bases instead of concentrating them at just one facility where they might be vulnerable to, say, a Chinese ballistic-missile barrage. Soon the whole six-squadron front-line F-22 force adopted the Rapid Raptor concept. In April 2016 the Florida-based 95th Fighter Squadron sent a pair of F-22s on a quick-fire tour of Eastern Europe as part of the U.S. military plan for deterring Russia in the aftermath of Russia’s invasion of Ukraine. In March 2017, a C-17 supported two F-22s on a mission to Australia. On the ground, the F-22s refueled from the C-17’s wing tanks. In July 2017, Air Force commandos in the United Kingdom practiced deploying to an austere airfield to quickly refuel and rearm F-15s. It was the first time that Air Force special operators and their MC-130 transports had teamed up with F-15C fighters at a so-called forward arming and refueling point, or FARP. The “Rapid Eagle” exercise involved three separate wings — the 48th Fighter Wing at the Royal Air Force base at Lakenheath and the 352nd Special Operations Wing and 100th Air Refueling Wing, both at RAF Mildenhall. 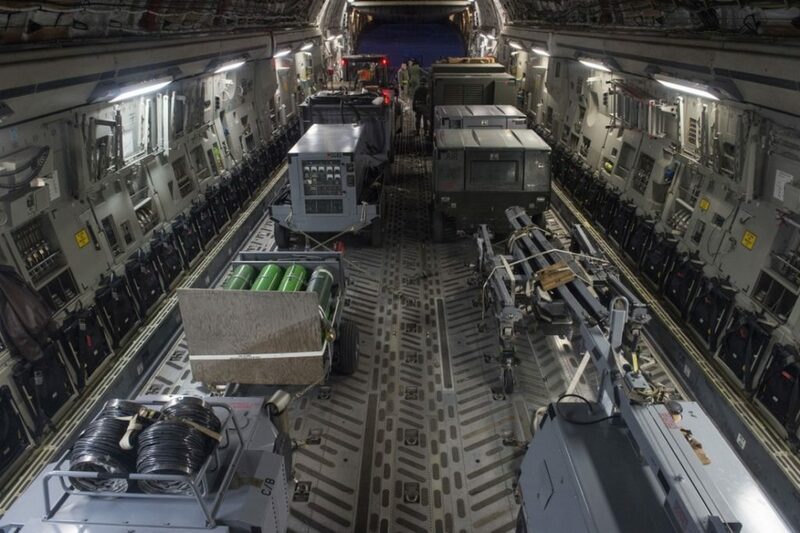 Two MC-130Js from the 352nd SOW flew to Lakenheath, picked up maintenance crews and ammunition, returned to Mildenhall to drop them off and then continued to an undisclosed location — the FARP — to refuel and rearm four Lakenheath F-15Cs alongside personnel from the 100th ARW. Air Force officials said they would to adapt the Rapid concept to other warplane types. “We’re working on ‘Rapid Next,'” Gen. Herbert Carlisle, then commander of the Air Combat Command, said in September 2015. In 2017 the Air Force folded the Rapid scheme into its “agile combat employment” doctrine. The HH-60 rescue helicopter, the F-16 fighter and the new KC-46 tanker reportedly are under consideration for Rapid-style deployments. Meanwhile, the Air Force has been exploring new basing options across the Pacific region for these small detachments. The flying branch rebuilt an old airstrip at Tinian in the South Pacific and began rotating B-52 bombers through a base in Darwin in northern Australia. “If we have U.S. air power show up in places and at times people don’t anticipate, that has a great effect for assuring friends and partners and has a deterring effect on potential adversaries and aggressors,” Carlisle said. But under existing command concepts, widely-flung fighter detachments could heavily rely on satellite communications in order to receive taskings and target information from a small number of large, centralized Air Force operations centers. If China has jammed or destroyed the satellites, the Rapid detachments could find themselves operating in isolation. To mitigate that risk, the Air Force wants detachment commanders to operate independently. “So how do folks actually, don’t wait for direction, they get enough direction early enough from me so that they can actually go execute?” Pacific Air Forces commander Brown asked. Borrowing from the recent past, the Marines and Army have proposed one answer. Spread thin during the middle years of the Iraq occupation, the Marine Corps developed a concept it called “distributed operations,” wherein companies of a hundred or so Marines operated independently, relying on junior leaders to creatively interpret vague orders from their chain of command. The German army in World War II famously delegated responsibility to junior officers, resulting in nimble, resilient forces that rapidly adapted to changing battlefield conditions. In other words, a colonel should tell his lieutenants and sergeants what effect they’re supposed to achieve, then trust them to achieve it in their own way without a lot of second-guessing by distant commanders. Mission command is a popular concept among Army thinkers. As an unfortunate side effect, some of the idea’s champions also have adopted the white-supremacist ideology of their German intellectual forebears. Their moral failing doesn’t necessarily abrogate the soundness of the underlying military concept. And now the Air Force is backing into the same way of thinking. The flying branch is bettering that it can chop up its 20-plane fighter squadrons into detachments of four or six planes, pair them up with transports and maintainers and send them far and away to do battle without top-down management. It’s innovation born of necessity. “When we look at our pacing threat of China, we got to think differently about how we do things,” Brown said.